The icy tones of this monochromatic ornament remind us of the cool colors of winter. Because it would be challenging (at best!) to trace the pattern onto the felt with a marker, we used an uncommon method to transfer it: a Chartpak blender marker and a photocopy of the template. Continue reading to learn more about this technique. Once you make this ornament, click here to see how to make custom ribbons using the same technique! Print the template on a LASER printer. (Ink jet will not work!) You can print the template at a print shop like FedEx Office, Staples, or Office Depot. Or you can print it at home on your ink jet printer and then photocopy it wherever there is a laser copier. Many grocery stores have a copy machine near the customer service desk. Note: Keep in mind that the template is only good for one transfer. So, if you are going out of your way to make laser copies, print extras! Cut around the piece leaving a 0.5" border. Tape the template face down on the felt. Make sure the tape does not overlap the black lines. Cut along the solid, outer line of the ornament and then cut another ornament shape. Set the blank ornament piece aside. Cut a piece of dark silver metallic floss and separate 2 strands. Set the other strands aside. Combine 2 strands of Kreinik blending filament and 1 strand of light gray floss. Embroider lines from the remaining dots (middle circle) to the center. Set aside. Now cut a piece of ribbon that is 9" long. Fold in half and sew the ends to the blank felt piece, overlapping the top point by about 1 inch. Stack both felt pieces and begin sewing together with a running stitch. Use 2 strands of light gray floss and 1 strand of Kreinik blending filament. Once sewn about 3/4 around, fill with Poly-Fil® and then finish sewing. See this article on how to tie off the thread and hide the knot. Now your ornament is complete! Make a matching embroidered card. 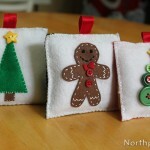 Use a pin to poke holes based on the template in the card and then proceed to embroider it. Sew the starburst the same as above and use a backstitch to sew the outline of the ornament. Don’t tie the ends in a knot; leave a 2–3" tail and weave it through the stitches instead. This way, your card will lay as flat as possible.